Music sets the mood for every important occasion in our lives; what if you could experience it using another one of your five senses, sight? BrighTTone: A sound-activated, interactive, portable device that connects music with dynamic colorful lights. Watch your music play! BrighTTone is able to connect surround sound with color waves to create a unique music-listening experience bringing a visual element to a party, casual gathering, or just a night at home by yourself. BrighTTone can be used by music and gadget enthusiasts, business owners looking to add a unique flair to their space, as well as professional musicians, as part of a live event or show. Use BrighTTone indoors or out. Static: Light can be displayed in 15 different colors. Colors can be changed manually or automatically, blink, and fade. Sound-Activated: Brightness of the selected color is determined by the external sound that comes through the embedded high sensitivity microphone. In order to support different volume levels of the surround sounds, the device is equipped with an embedded automatic gain control circuitry (AGC) as well as with manually adjustable signal amplification, so the user has many ways to control brightness and colors dynamic. BrighTTone can be used in a single or multiple displays installation and the whole set can be controlled from a single IR remote control using unicast or broadcast control. Each BrighTTone Display has an embedded Li-Ion rechargeable battery and uses wireless inductive base for battery charging; just place the BrighTTone Globe on top of the base and battery charging process will start. The Base has an LED indicator showing charging progress. Additional Displays, charging bases and remote controls are optional and can be purchased separately so you can expand the number of frequency channels in your set and have spare chargers or remote controls handy. When not in use for an extended period of time (4 hours +), BrighTTone will switch Off automatically going into deep sleep mode and will require pressing the button at the bottom of the Display in order to activate it again. The same button can be used at any time to switch the Ball Display Off (just hold down for three seconds). You can also hold this button down for ten seconds to reset the display to the factory default state. “Auto Calibration” - Each BrighTTone display can automatically adjust the signal gain based on the surround sound volume. In this mode, the device's logic will automatically adjust the input signal amplification level to make the most out of the displayed light brightness. BrighTTone supports three levels of signal amplification scale: auto calibration while sound is low ( “B”), medium ( “G”) and high (“R”). Based on the common sense, sound level or music type, the user can try one of the three auto calibration level scales to make the best representation for the brightness and colors dynamic. After auto calibration is completed, you can always adjust the signal level manually using "+" or "-" buttons. “Saving Configuration Parameters” - Once you've found a configuration you're happy with (colors, frequencies, scale and signal amplification level), you can save your preferences to the device. After the saving command is executed display will blink twice acknowledging the operation. You can always adjust the sound configuration parameters and store them again as many times as you need or you can do manual temporary adjustments without saving. You can save your preferred parameters for individually addressed BrighTTone devices or for multiple units placed in the broadcast listening mode for group control. Next time your device is powered On and sound activation mode is selected, the last saved sound configuration parameters will be restored automatically. “Silence back-light” when there is no outside sound (sound level is below the default sensitivity level) for more than three seconds, BrighTTone will enter into the back light silence mode, displaying dimming color. As soon as new sound is detected, BrighTTone will exit silence mode automatically. Silence mode can be turned on and off using the ON/OFF buttons on each device. Each device comes ready to use with the default enabled broadcast address and active listening mode and does not require any additional programming. If purchased set consists of more than one device, every Display in the set has to be programmed to the unique device address, (instructions for doing this are provided with the device). 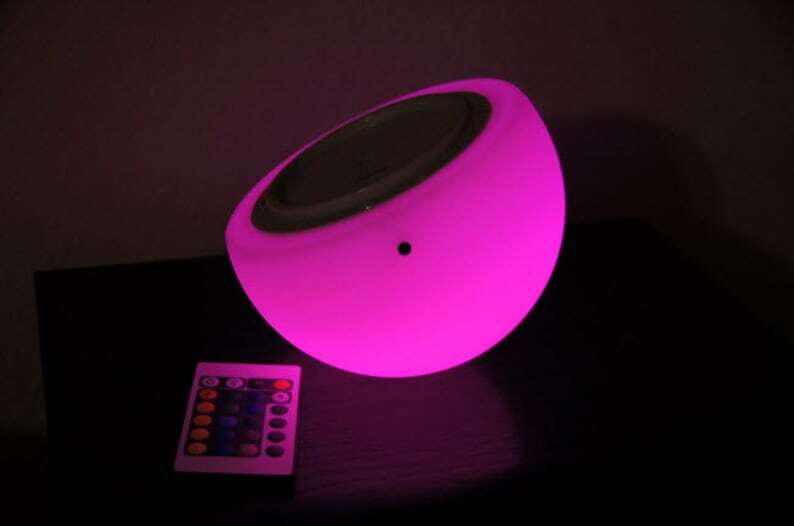 Sound-Activated Device Connects Colors and Music - Light Music RGB LED Lamp 12"
Colors are amazing, only thing that bothers me is the flicker that tends to happen when you have the lights set to go with the music. When the volume is low, they flicker. Top notch customer service! Timely delivery! Excellent product!